Objective To evaluate the relation between adherence to drug therapy, including placebo, and mortality. Data sources Electronic databases, contact with investigators, and textbooks and reviews on adherence. Review methods Predefined criteria were used to select studies reporting mortality among participants with good and poor adherence to drug therapy. Data were extracted for disease, drug therapy groups, methods for measurement of adherence rate, definition for good adherence, and mortality. Results Data were available from 21 studies (46 847 participants), including eight studies with placebo arms (19 633 participants). Compared with poor adherence, good adherence was associated with lower mortality (odds ratio 0.56, 95% confidence interval 0.50 to 0.63). Good adherence to placebo was associated with lower mortality (0.56, 0.43 to 0.74), as was good adherence to beneficial drug therapy (0.55, 0.49 to 0.62). Good adherence to harmful drug therapy was associated with increased mortality (2.90, 1.04 to 8.11). Conclusion Good adherence to drug therapy is associated with positive health outcomes. Moreover, the observed association between good adherence to placebo and mortality supports the existence of the “healthy adherer” effect, whereby adherence to drug therapy may be a surrogate marker for overall healthy behaviour. Much of the literature on adherence focuses on methods for measuring adherence and identification of risk factors for poor adherence,3–6 with the premise that good adherence must be associated with good health outcomes.7 Although the most detailed systematic review on adherence in the literature included a wide array of disease states, drug therapy was only one element within a range of therapeutic interventions.7 Combining adherence to drug therapy with adherence to other behavioural and therapeutic interventions limits the ability to examine specifically the relation between adherence to drug therapy and health outcomes. This is contrary to the proposition that a placebo has little effect on health outcomes8 and has led to speculation that adherence to drug therapy may act as an identifiable marker for overall healthy behaviour, the so called healthy adherer effect.w1-w4 8–10 We tested this hypothesis by summarising published observations of the relation between adherence to drug therapy and mortality, with a particular interest in placebo arms of controlled studies. We used standard systematic review methods.11 Eligible for inclusion in our study were randomised controlled trials, retrospective analyses of data from randomised controlled trials, and observational studies evaluating the association between adherence to drug therapy and mortality. We applied no language restrictions. A professional librarian (JV) carried out the literature search. She searched several electronic databases from inception date to 20 June 2005: Allied and Complementary Medicine (AMED), Cumulative Index to Nursing and Allied Health Literature (CINAHL), Embase, Educational Research Information Center (ERIC), HealthSTAR, Medline, PsycINFO, and the Web of Science. Articles were identified using synonyms for adherence and mortality as database specific subject headings and keywords. We also checked references from textbooks12–14 and review articles1 7 9 10 15–17 on adherence for additional articles. After excluding editorials, conference proceedings, letters, news articles, government reports, and practice guidelines, two investigators (SHS, DTE) independently screened titles and abstracts to identify potentially relevant citations. A citation was retained for further evaluation if either investigator selected it. Citations were excluded that did not report original data, have human participants, evaluate drug adherence, or report patient adherence. 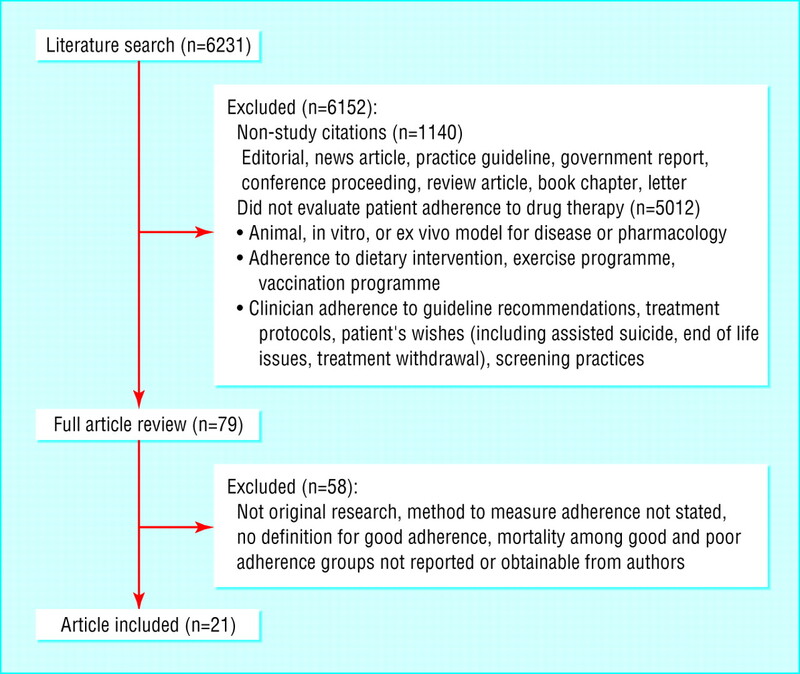 Each potentially relevant article was reviewed to determine if it met the following inclusion criteria: described original research, explained the method used to measure adherence (for example, self report, electronic drug event monitoring system, pharmacy refill data, clinician estimation, tablet count), provided a clear definition for good adherence, stratified patients into good and poor adherence groups, and reported mortality according to adherence groups. Discrepancies were resolved by majority vote after review by a third investigator (JAJ). Two investigators (DTE, RSP) used standardised forms to extract data from the included articles for disease state, drug therapy groups, methods used to measure adherence, definition for good adherence, and mortality. Accuracy of data collection was verified by comparing forms. We used the study authors' definition to stratify participants into good and poor adherence groups. When the number of deaths according to adherence group was not specifically stated in the article, we calculated this value from available information. If there was insufficient information in the article to calculate mortality according to adherence group, we contacted the corresponding author. The study was excluded if we were unable to obtain from the authors the number of deaths in each adherence group. We analysed data using Rev Man 4.2.7. Each treatment arm in a randomised controlled trial was considered a discrete analysis of the relation between adherence and mortality. We used a random effects model to calculate pooled odds ratios and 95% confidence intervals.20 Given the inclusion criteria, we anticipated including studies of a variety of diseases; therefore we examined heterogeneity using the Q and I 2 statistics.20 21 We used a variation of Tobias' method to evaluate changes to the pooled odds ratio and tests for heterogeneity.22 Rather than removing one study at a time, we used predetermined subgroups to identify potential sources of heterogeneity. For example, to test the theory of a healthy adherer effect,w1-w4 8–10 we constructed a separate model to summarise the association between adherence to placebo and mortality. A priori subgroups included the effect of active treatment compared with placebo, study design, disease state, method used to measure adherence, and definition for good adherence. The primary analysis of mortality risk according to adherence group was based on 2779 (5.9%) deaths in 46 847 participants. Overall, 1462 (4.7%) deaths occurred in 31 439 participants with good adherence to drug therapy and 1317 (8.5%) deaths in 15 408 participants considered to have poor adherence. The pooled odds ratio for mortality for good adherence compared with poor adherence was 0.56 (95% confidence interval 0.50 to 0.63). Some degree of heterogeneity was found: Q statistic P = 0.08 and I 2 = 28.6%. 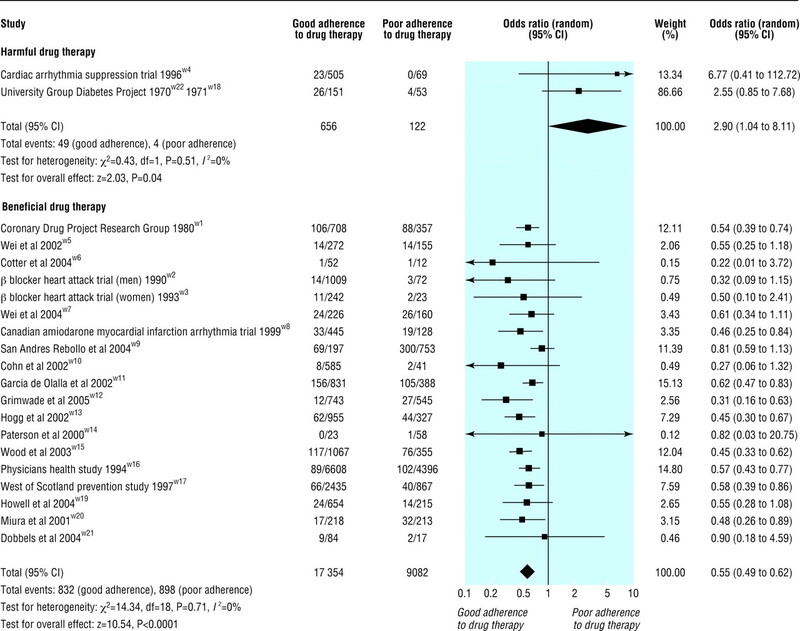 The placebo arms from eight studies contained 19 633 participants and reported 996 (5.1%) deaths.w1-w4 w8 w16-w18 w22 Overall, good adherence to placebo was associated with a lower risk of mortality: pooled odds ratio 0.56, 0.43 to 0.74 (fig 2). Some heterogeneity of effect was found in this analysis: Q statistic P = 0.05 and I 2 = 51.2%. A subgroup analysis restricted to studies of drug therapy after myocardial infarction reduced variance substantially: Q statistic P = 0.79 and I 2 = 0%.w1-w4 w8 The pooled odds ratio of these five studies was 0.45 (0.38 to 0.54). Two studies were identified in which active drug therapy increased the risk of mortality compared with placebo.w22 23 Therefore separate models were constructed to summarise the effect of adherence to active drug therapy found to be harmful compared with beneficial (fig 3). The two studies evaluating adherence to harmful drug therapy reported 53 (6.8%) deaths in 778 participants.w4 w18 w22 The pooled odds ratio for mortality was 2.90 (1.04 to 8.11) for participants with good compared with poor adherence to the active treatment (fig 3). This meta-analysis of 21 studies, involving 46 847 participants, showed a consistent association between adherence to drug therapy and mortality. For participants with good adherence to placebo or beneficial drug therapy, the risk of mortality was about half that of participants with poor adherence. Conversely, the risk of mortality was more than doubled for participants with good adherence to proved harmful drug therapy compared with participants with poor adherence. The association between adherence to harmful therapy and mortality is important in the light of recent issues of patient safety and post-marketing drug surveillance. Our observation suggests that stratification by adherence group may facilitate earlier identification of harmful therapies if the rate of adverse events is higher in participants with good adherence. According to the consolidated standards of reporting trials statement, investigators should, at a minimum, report the number of participants receiving the intended treatment.24 Although randomised clinical trials will often measure adherence—either through pill count from returned vials or information on frequency of refills—this information is usually reported only as an overall adherence rate.25 Many authors have identified that an array of adherence rates can confound the association between treatment and response and substantially affect generalisability.25–27 Therefore we would encourage clinical trialists to consider reporting treatment effects stratified by adherence group. In 1997 McDermott and colleagues reviewed the literature on cardiovascular disease that reported admission to hospital and mortality according to adherence groups.9 They found that seven of 12 studies had a significant association between adherence and outcomes and noted that adherence to placebo was associated with improved outcomes in three studies. More recently DiMatteo and colleagues determined that the risk of a poor health outcome was 26% lower in participants with good adherence.7 Although that meta-analysis included studies from a wide range of medical conditions, drug therapy was included with a variety of other healthcare interventions. In addition, the placebo arms from controlled trials were excluded from their analysis. Our study confirms, updates, and extends these observations by including studies from across several disease states and summarises the observations between adherence to drug therapy (both active drug and placebo) and mortality. Our study shares limitations inherent with meta-analyses in general and with studies of adherence specifically. Firstly, important studies relevant to the research question may have been missed during the literature search, although this was unlikely. Secondly, as with previous reviews,7 9 our data sources were observational studies, thus restricting our ability to explore fully the influence of unmeasured confounding variables. For example, participants with good adherence to study drugs (even placebo) may also have good adherence to other healthy behaviours such as diet, exercise, regular follow-up with healthcare professionals, immunisations, screening, and use of other drugs.w1-w4 8–10 All of these could independently affect the risk of mortality. Conversely, participants with poor adherence may have consciously chosen to use a lower dosage28 29 or have other conditions, such as depression, that affect adherence.10 30 In the absence of individual patient data to control for these factors, we tested the healthy adherer effect hypothesis and assumed that the presence of good adherence is a marker for overall healthy behaviour.w1-w4 8–10 Thirdly, in the absence of an ideal method to measure adherence,31 we observed a wide variety of measurement methods and definitions for good adherence. Grouping studies according to measurement method and definition for good adherence did not, however, result in substantive changes to our overall observation. Finally, with the exception of two studies,w6 w20 all studies used indirect methods to measure adherence. These methods are limited by the assumption that drug acquisition is a reasonable surrogate for consumption. This assumption would, however, overestimate exposure and bias our observation towards the null. With these limitations in mind, our findings support the tenet that good adherence to drug therapy is associated with positive health outcomes. Moreover, the observed association between good adherence to placebo and lower mortality also supports the existence of the healthy adherer effect, whereby adherence to drug therapy may be a surrogate marker for overall healthy behaviour. Our findings set the stage for future studies to address the causal relation between adherence and health outcomes, but, more importantly, quantify for patients and providers how important it is to take drugs of proved efficacy as prescribed. We thank the individual trialists for providing information from their study databases and Maria Santana, who translated three Spanish papers. Contributors: SHS had the idea for the article. All authors took part in the planning and design of the study. SHS, DTE, RSP, and JV did the data collection. MS (listed in the acknowledgements) assisted in data collection from articles printed in Spanish. SHS carried out the statistical analyses. SHS,DTE, SRM, RSP, RTT, and JAJ had access to the data and participated in the interpretation of the data. SHS wrote the first draft of the paper. SHS provided leadership for the study and is guarantor.
. Variations in patients' adherence to medical recommendations: a quantitative review of 50 years of research. Med Care 2004;42: 200–9.
. The multilevel compliance challenge: recommendations for a call to action. A statement for healthcare professionals. Circulation 1997;95: 1085–90.
. Patient compliance—an overview. J Clin Pharm Ther 1992;17: 283–95.
. Patient decision making. The missing ingredient in compliance research. Int J Technol Assess Health Care 1995;11: 443–55.
. Adherence to pharmacological interventions. Current trends and future directions. The Pharmacological Intervention Working Group. Control Clin Trials 2000;21: S218–25.
. Adherence to medication. N Engl J Med 2005;353: 487–97.
. Patient adherence and medical treatment outcomes: a meta-analysis. Med Care 2002;40: 794–811.
. Adherence and the placebo effect. In: Shumaker SA, Schron EB, Ockene JK, eds. The handbook of health behavior change. New York: Springer, 1990: 515–34.
. Impact of medication nonadherence on coronary heart disease outcomes. A critical review. Arch Intern Med 1997;157: 1921–9.
. The impact of patient adherence on health outcomes for patients with chronic disease in the medical outcomes study. J Behav Med 1994;17: 347–60. eds. Cochrane handbook for systematic reviews of interventions 4.2.5 [updated May 2005]. www.cochrane.dk/cochrane/handbook/hbook.htm (accessed 3Apr2006).
. The handbook of health behavior change. New York: Springer, 1990.
. Patient compliance in medical practice and clinical trials. New York: Raven, 1991.
. Adherence to treatment in medical conditions. Australia: Harwood Academic, 1998.
. A systematic review of adherence with medications for diabetes. Diabetes Care 2004;27: 1218–24.
. Patient adherence to HIV medication regimens: a review of published and abstract reports. Patient Educ Couns 2002;46: 93–108.
. Antiretroviral adherence interventions: a review of current literature and ongoing studies. Top HIV Med 2003;11: 185–98.
. A coefficient of agreement for nominal scales. Educ Psychol Meas 1960;20: 37–46.
. The measurement of observer agreement for categorical data. Biometrics 1977;33: 159–74.
. Measuring inconsistency in meta-analyses. BMJ 2003;327: 557–60.
. Assessing the influences of a single study in meta-analysis. Stata Tech Bull 1999;47: 15–7.
. Mortality and morbidity in patients receiving encainide, flecainide, or placebo. The cardiac arrhythmia suppression trial. N Engl J Med 1991;324: 781–8.
. The CONSORT statement: revised recommendations for improving the quality of reports of parallel-group randomized trials. JAMA 2001;285: 1987–91.
. Drug compliance in therapeutic trials: a review. Control Clin Trials 1998;19: 257–68.
. Patient compliance and the conduct and interpretation of therapeutic trials. Control Clin Trials 1987;8: 12–9.
. Compliance as an explanatory variable in clinical trials. J Am Stat Assoc 1991;86: 9–26.
. Intelligent noncompliance with special emphasis on the elderly. Contemp Pharm Pract 1981;4: 8–11.
. The meaning of medications: another look at compliance. Soc Sci Med 1985;20: 29–37.
. Depression and diabetes: impact of depressive symptoms on adherence, function, and costs. Arch Intern Med 2000;160: 3278–85.
. In search of the gold standard for compliance measurement. Arch Intern Med 1979;139: 627–8.